Congratulations to our 2017 City of Philadelphia Mayor's Scholarship Winners! Hardworking, diligent and inspiring – three characteristics that describe the two newest recipients of this year’s City of Philadelphia Mayor's Scholarship. After completing applications and interviews, Gregory D. Wright, Jr. and Elizabeth McSorley became the 2017 scholarship winners. Last night, we celebrated the well-deserving winners as they and their support systems joined us on campus for a reception honoring their academic rigor and professional excellence. 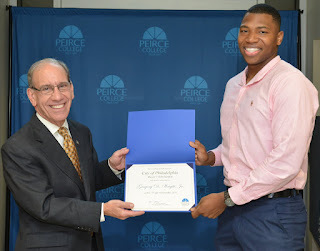 Gregory D. Wright, Jr. is a current Peirce student studying Criminal Justice. He found Peirce College through his best friend who was earning his associate degree at the time from Peirce. Feeling inspired by his friend’s journey, he found himself applying and registering for classes as soon as possible. As for Elizabeth McSorley, she’s one of our newest Peirce College students and has just entered her first session in the Business Administration program with a concentration in Management. She always wanted to head back to school and complete her degree. But Elizabeth wasn’t sure when she would fit college in with being a mother of two and working full-time for the Philadelphia Court System. One day, Elizabeth decided now was as good of time as any and just like that began the process. “I did some online research regarding different colleges and universities, and Peirce sounded like the college that was fit for me,” she recalls. Elizabeth was ready to advance in her career while bettering herself and becoming a stronger role model for her children, so off to Peirce she went. 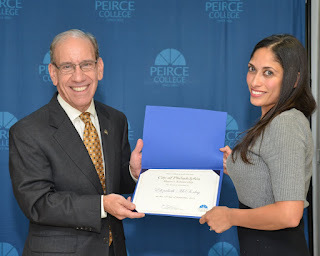 Luckily, Peirce College had what Elizabeth needed, but she knew she could not do this alone. “My husband has been my biggest inspiration in this process. He understands how important education is and is a big supporter of me returning to school,” explains Elizabeth. Between the support of her husband and the opportunities available at Peirce, she knew she could finally accomplish her dreams. Gregory and Elizabeth took completely different paths to Peirce. They are working adults balancing a lot on their plates, but each has the drive and positive attitude to get them to the end goal of graduation. We applaud both of the 2017 scholarship recipients and wish them nothing but the best as they continue on their Peirce educational journey. M.S.O.L.M. may be for Y.O.U.